This is a rare Bronze Age silver 'lock-ring', dating to circa 1600 - 1400 B.C. This item would have acted as a single link in a regal chain or royal collar. 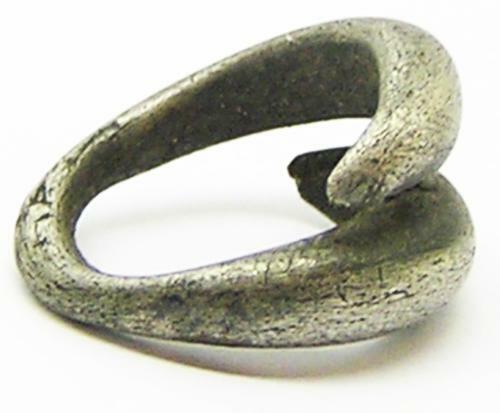 These 'lock-rings' were used as a form of currency for trade (a precursor to Celtic Ring-Money). Similar 'lock-rings' can be seen in the British Museum. This example is smaller than some of the larger ones I have sold, so likely formed one of the outer links in a graduated chain. Silver again seems to be much rarer than gold examples.